"Sea dragons have a range of less than 110 metres"
A closer view of this section of the trip. Erldunda is top of track and Coward Springs is bottom right. It rained all night and was quite heavy in the few hours till about 6 am. We get up at about 7:40 am and quickly pack up during a lull in the rain. 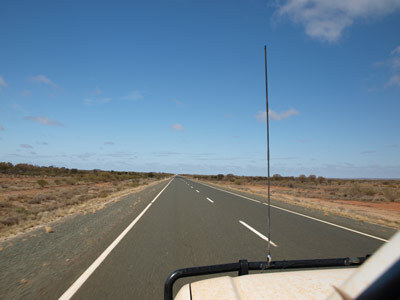 We leave at 8:37 am and head south on the Stuart Highway. It is raining all the way. 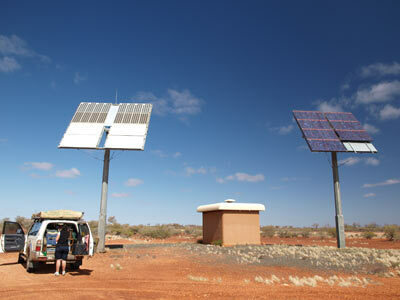 At 9:25 am we stop at Kulgera Roadhouse, 76 kilometres down towards the South Australian border. Peter F needs to get fuel here and Tomas and Kelly get some breakfast. We depart about 15 minutes later and the rain finally stops about 20 kilometres south of the border. There is blue sky to the south and west, it is looking much better. 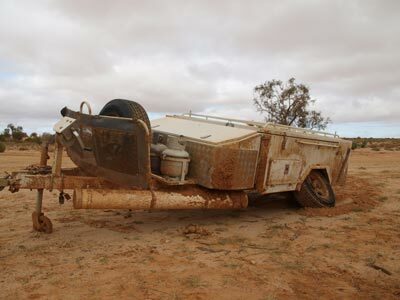 I still do not hold out much hope of getting onto the Oodnadatta Track, especially if the latest rain has reached there. 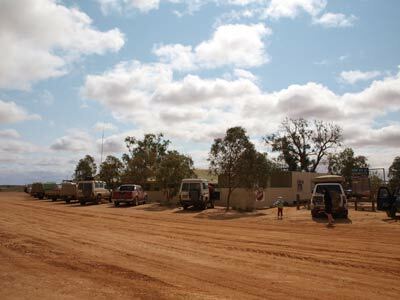 At 10:37 am we stop at a rest area at a place called Agnes Creek, 172 kilometres south of Erldunda. The camping here is pretty good. 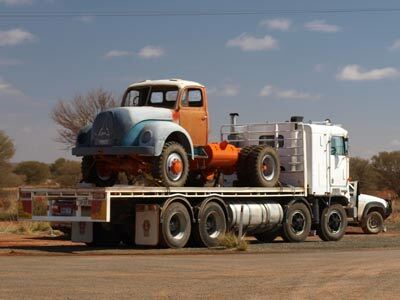 Since leaving Erldunda we have passed hundreds of old trucks on the way to Alice Springs for the truckies gathering. At 11:50 am we arrive at Marla Roadhouse. 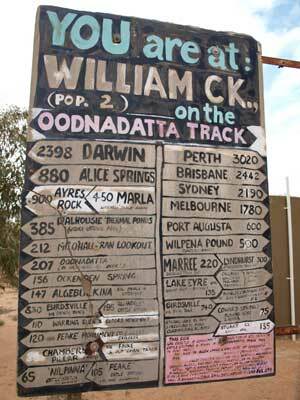 I check the road report here by phone and find that the road to William Creek from Coober Pedy is now open. However, none of the other roads are open. We decide that we may go to William Creek and hope that the road south opens within a day or two. I again phone Wrightsair at William Creek. I have been trying to contact them for the past two days as we have flights booked with them for next Sunday over Lake Eyre. Obviously, with the roads closed and us so far ahead of schedule, it is looking like we cannot do the flight as they moved all their planes to Coober Pedy and Marree. I still cannot get them and leave another message. We leave at 11:57 am and continue south. 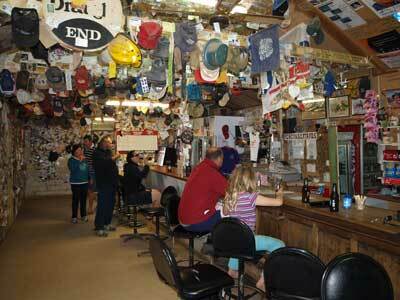 At 1:15 pm we stop at a telecom repeater station at Matheson Bore for lunch. We are back on the road at 1:42 pm. 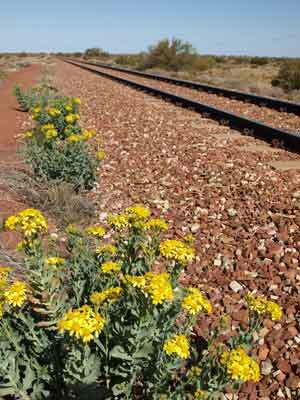 At 2:04 pm we are close to the new Ghan Railway line so we take a track to it for some photographs. It is quite cold, 12.3ºC and windy. 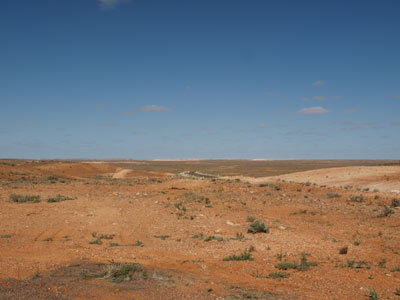 We leave after 15 minutes and continue onto Coober Pedy. We arrive there at 3:15 pm. We go to the Police Station to check the road conditions but it is not staffed and the report is out of date. We go to the visitor centre and find the report is the morning one. As they put out another one about midday, we phone the dedicated number to see the latest. This shows that the road to Marree and onto Lyndhurst is now open. We are definitely going to William Creek. I phone Wrightsair and finally get someone to speak to. I advise that we want to fly on Thursday if possible but it looks like we will have to go on Friday. I also try Peter T to let him know but only get voicemail. I also send an SMS to him telling him we will camp on the William Creek Road. We need to get some wine so we go to the bottle shop and then refuel. I take 143.9 litres at $1.439 a litre = $190.84. We leave at 3:40 pm and head south to the William Creek Road turnoff. At 3:55 pm we cross a creek which looks nice so we stop and camp on the northern side of the road on the eastern side of the creek. This is a nice spot. It is now a lot warmer, 18ºC but very windy. We set up camp and I put on a fire at 4:30 pm. We are having a roast dinner so need lots of coals, hence the early start. There is a nice sunset and soon after, the full moon comes up. We have not seen the moon for the past week, so it is a great sight. The roast consists of two smallish chickens we purchased from the IGA at Yulara. They are marinated already. We have two camp ovens and put one in each together with some potato, carrot and pumpkin. They take about 50 minutes to cook. The chicken is very tender and tastes great. Another great meal. We have not seen any vehicles since we got here but a small petrol tanker passes heading towards William Creek. 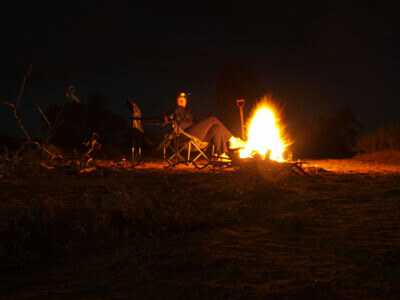 We sit around the fire and watch the moon rise, brilliant. I make some pancakes for dessert and after some chatting, we go to bed at 9:30 pm. Just as I am about to climb into the Shippshape, we hear a 4WD drive coming. Could it be? Sure is, Peter T has found us. 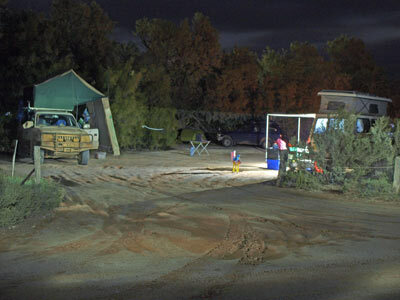 Turns out he has had dinner in Coober Pedy with the kids and by phoning his wife Elly in Sydney, found out where we are camped. This is because Kelly and I have a Spot device. This enables you to send out a message using GPS and the satellite phone system indicating your location. The back-end system then emails and SMSs this to whoever you have on the list. A link to GoogleMaps shows exactly where you are located. The wind that had dropped about 8 pm comes back up again about 10:30 pm. We are not going far today, so there is no need to be up early. In addition, the drive yesterday was fairly long. I am up at 8 am and once the others are up, I cook some more pancakes for breakfast. 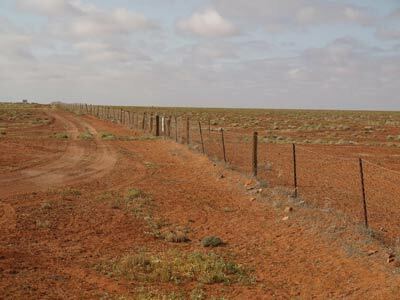 We leave at 9:35 pm and 24 kilometres along (9:52 am) we come to the Dog Fence and the border of the Woomera Prohibited Area. You are permitted to enter, but must remain on the road. 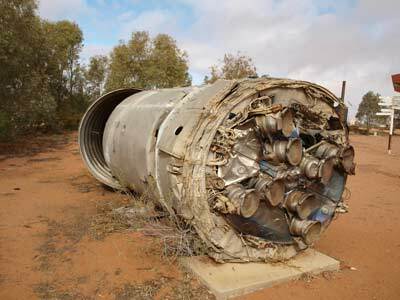 Woomera was established after World War II as Woomera Rocket (or Test) Range. It was used by the UK and Australian Goverments for launching and retrieving rockets of various sizes. The protected area is the size of England. We need to replenish our firewood and at 10:40 am we cross Engenina Creek and finally see some timber that we can cut. We are back on the road 10 minutes later. It has now clouded over a bit and the temperature is up to 15ºC. We are worried that more rain may be on the way. Last weekend 100 people were stranded at William Creek when the roads closed. It would be interesting, but something we can do without. At 11:05 am we stop for morning tea. The temperature has dropped a degree and it is really quite freezing, so strong is the wind. We move off at about 11:20 am and 10 minutes later we cross a creek. We are 78 kilometres from our camp site. On the other side of the creek is an abandoned camper trailer. It is an off-road camper, but the left wheel is totally stuffed, with the suspension bracket broken. 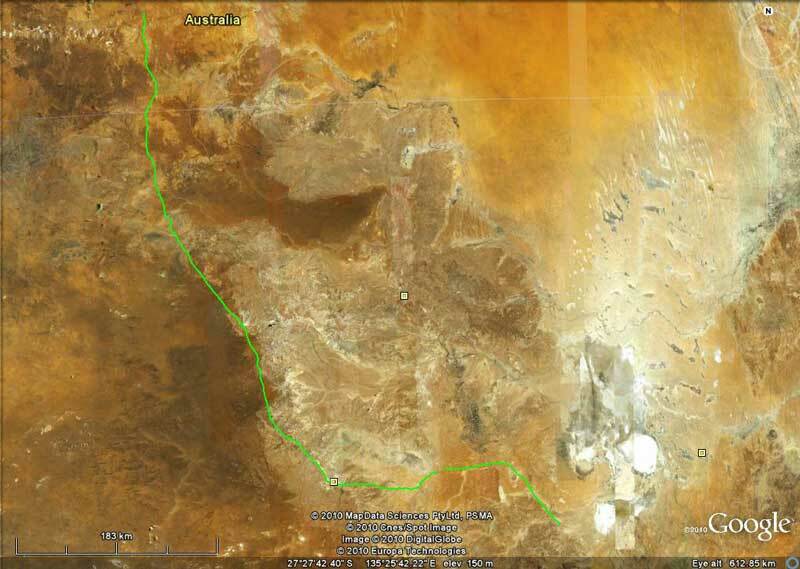 We can see where it broke as the trailer was being towed towards Coober Pedy and turned around. Must have happened yesterday we assume. There is also the wreck of an old truck and trailer. A few kilometres along we come across an abandoned cattle trailer. This is missing the front left set of wheels. 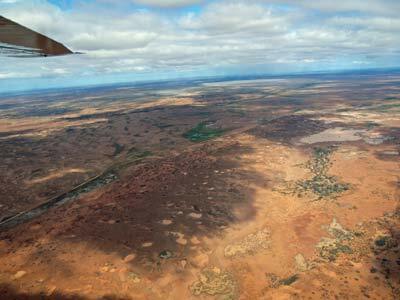 We continue and the land becomes a lot wetter, obviously there has been more rain here than back towards Coober Pedy. We arrive at William Creek at 1 pm, 154 kilometres from our camp site. We go to the William Creek Hotel and order a beer. It is pretty crowded, with lots of 4WDs outside. We decide to have lunch here and I order an emu pie and chips. Peter T orders a kangaroo pie and we decide to split them and have half each. The pies are great and the hamburger Kelly orders is also great. We have another beer to go with lunch. 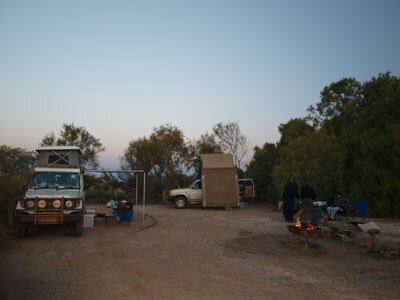 We book into the camping area (it is run by the pub - $10 per person) and move over. The ground is not in the best of conditions due to the recent rain, so we pick the best spot we can. 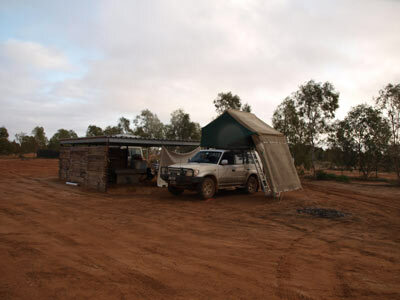 There are toilets and showers in mining-type donga transportable buildings. 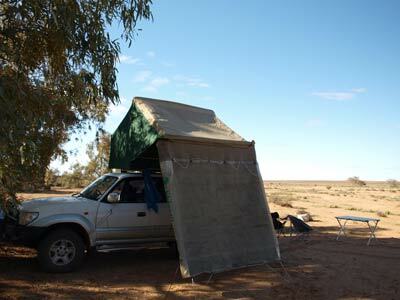 We walk to the WrightsAir office which is right next to the camping area and opposite the hotel. 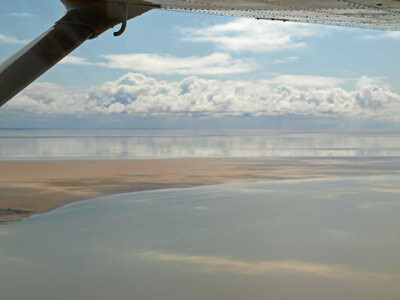 We finally can set a time for our Lake Eyre flight which we have to bring forward from next Sunday. We are booked to fly at 11 am tomorrow morning. Peter T books onto a flight at 8 am. We read for the rest of the afternoon and walk to the park opposite the hotel and take pictures of the recovered rockets and other items. The showers are in "dongas" (used a lot at mining areas) and it is good to have a clean. We have steak and sausages with pasta and salad for dinner. Kelly cooks a chocolate cake for Peter T's birthday which was yesterday. We head over to the pub for another beer while the cake cools. There are only a few people here and we have a couple of beers and wines. Peter T and the kids come over to have the ice cream that Peter has promised them. Melanie and Keith sit on the pub floor, looking like the feral kid out of Mad Max 2 - The Road Warrior. They are filthy, refusing to wash or change their clothes. We go back to the cars and Kelly ices the cake and we celebrate Peter T's birthday. We go to bed at 10 pm. I am up at 7:40 am and it is very windy and cold. We have breakfast and lounge around. Peter T returns from his attempt to do his flight to announce that he was bumped. That's what happens when you pay cut-price, they go for someone who has paid the full fare. Peter T announces his plan to wash the two kids as they are really filthy. Kelly decides to wash their clothes. Peter F and I assist, the colour of the water that comes out cannot be believed. We head off to the Wrightsair office at 10:40 am as planned. 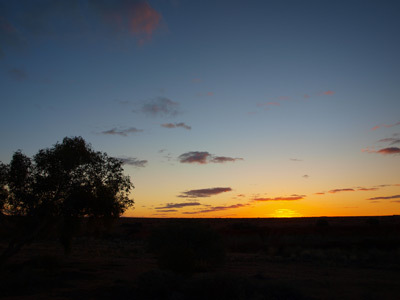 However, they are running very late, with planes still coming in from Marree and Coober Pedy. They will soon have six planes flying out of William Creek. We end up heading off at 12:10 pm, with Peter T and the kids flying only a few minutes later. 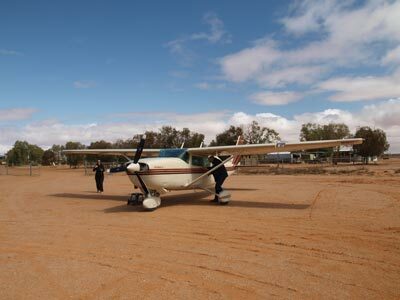 Our flight is in the largest of the planes they have here and we head east towards Lake Eyre. We are on a one hour flight that cost us $220 each. The area around William Creek has hundreds of small lakes and ponds everywhere. 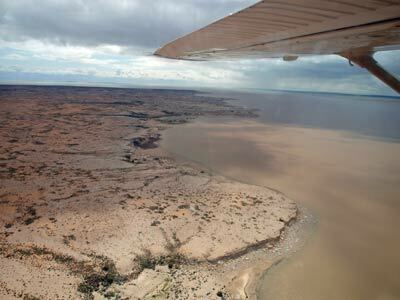 We fly over the road to Haligan Bay on Lake Eyre North and see that some sections are 100 metres of water/mud, 100 metres of dry road and then another 100 metres of water/mud etc. 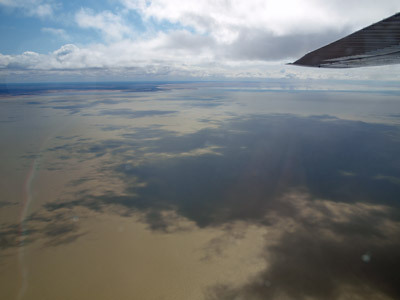 We are soon over Lake Eyre. The view is amazing, as far as you can see to the north is water. 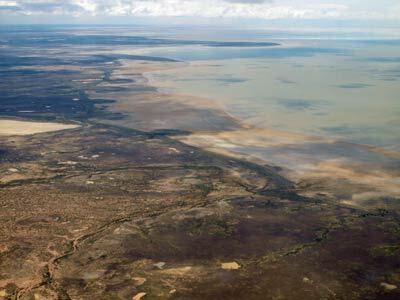 Lake Eyre is the largest lake in Australia and one of the largest salt lakes in the World, although for 90% of the time it has no water in it at all. 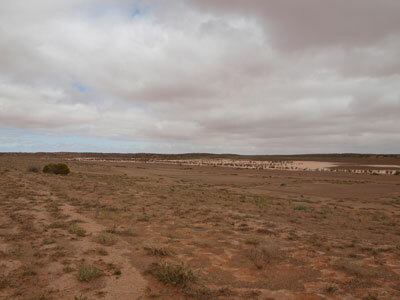 It is also the lowest point in Australia when dry, at minus 15 metres. 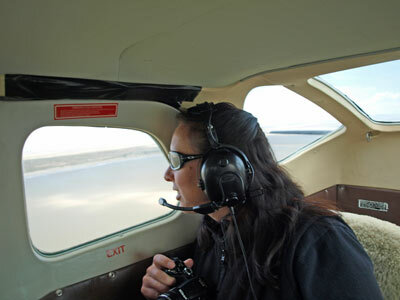 The flight is mostly at 1,500 feet but at one stage we drop to less than 500 feet. We fly over an island that has a large number of pelicans on it. There are lots of planes around and we can hear them talking to each other. There must be at least 10 in the area. We turn north and then back west. 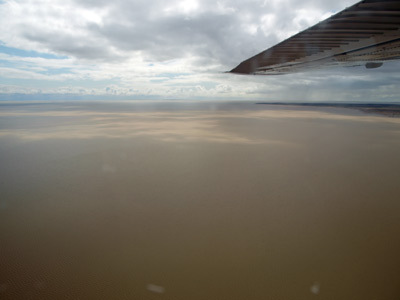 As we approach land, the pilot tells us that there are three vehicles stranded at Haligan Bay. 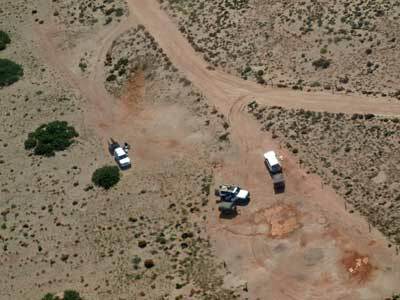 As we fly over, we see the three 4WDs, each with a camper trailer, as well as the occupents. As we continue back over the land, we can see why they cannot get out. 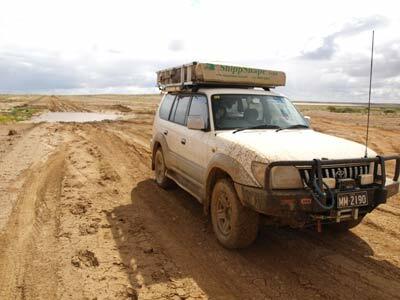 The road has so much water over it, in some sections extending well over a kilometre there is more water and mud than dry road. 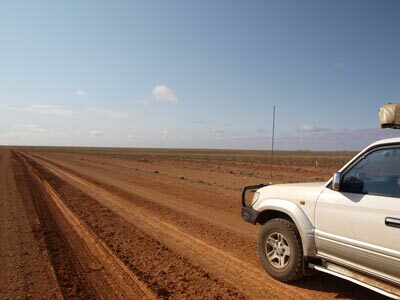 About 22 kilometres from the Oodnadatta Track we see a red Nissan Patrol, bogged to above the axles. This car definitely tried to go in after the rain. As he has already passed a numerous bad sections, we reckon he is not too bright to have kept on going. If he had been trying to get out you could have excused him. We arrive back at William Creek and after a perfect landing, we exit the plane, totally satisfied with our flight. Peter T and his kids have gone on the longer two hour flight so will not be back for at least an hour. We walk back to the Wrightsair office and have lunch. 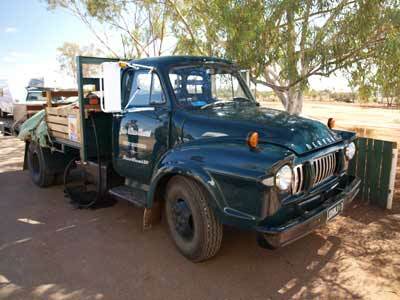 A Police 4WD from Coober Pedy is parked next to us and we chat to them. As we know, they are here to try to get the four cars out of the Haligans Bay road. We telling them about the Nissan and Kelly shows them a photograph of it to help them understand how bogged it is. We even think of offering to come along and help out! Would have been interesting. After lunch we head off at 1:40 pm. It is now fairly overcast and about 19ºC. It only takes seven minutes to reach the Haligans Bay turn-off. Ten kilometres along from here we come across a big bog right across the road. We get through okay. About 22 kilometres from William Creek we come to the Irrapatana ruins. These are the remains of buildings associated with the Old Ghan railway line. All along the old route there are regular ruins of buildings. Most of these are fettler cottages, used by workers who maintained the track. They are located about every 10 kilometres or so. At 2:30 pm we stop to collect some firewood and as I cut timber, I hear Kelly scream over the noise of the chainsaw. I clearly hear the word "snake". I look around and see a light brown coloured snake with a black marking behind its head quickly slither off. Peter F gets a photo of it before it goes into a small hole in the sand. We had thought that this was a taipan but now I am not so sure, as I cannot find any snake that looks like it. I will have to get Peter's photo and send it off to get identified. We finish cutting timber and head off at 2:40 pm. 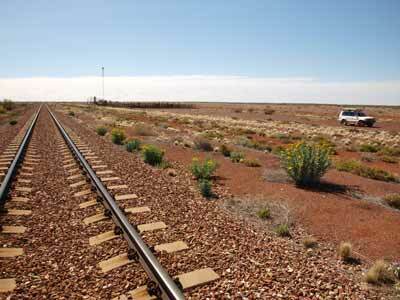 We stop at Beresford Railway Station. This now consists of a bore, earth walled tank, desalination plant and water tower as well as railway buildings. However, we could not get to the buildings as the tracks in were all covered with water and looked very, very muddy. We arrive at Coward Springs at 4:04 pm. We have not decided yet if we will stay here, as we are not sure how crowded it will be. 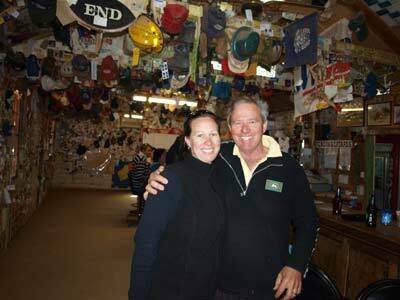 We pay our $1 each entry fee to have a look around. This was the site of another railway station as well as a train driver house and passing tracks. Nowadays some of the buildings have been restored. The train drivers' cottage is a museum/visitor centre. We watch as galahs take turns to slide down the corrugated iron roof, surfing on their claws and bums. They seem to be having a great time and then fly back to the ridge top to start again. There is a camping area here. This is well set out, with lots of small and larger sites, all quite private. There are also flushing toilets and a wood chip heated hot shower. All these are built out of old railway sleepers. 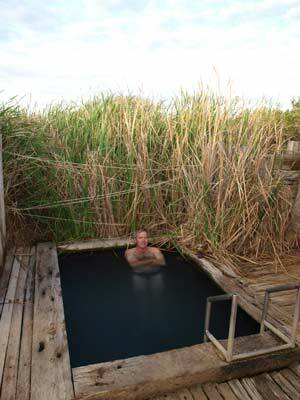 There is also a warm spa built out of sleepers. More about this later. We decide to camp here as it would be too far to go to Curdimurka Railway Station. 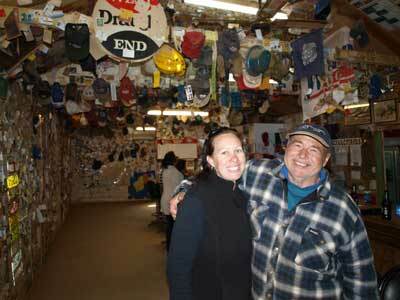 Kelly and I go back to the entrance and leave a sign for Peter T (we have told him we may stay here). We pay our fee ($10 per person) less the $1 we have already paid to look at the site. We move to the camping site closest the spa at about 4:30 pm. This is really quite protected from the reasonably strong southerly wind that is blowing. As we are having pizza for dinner, we have to get a good fire going for the coals. I make the dough for the pizzas and then Kelly and I then go to the spa. It is about 29ºC in the water and a strong blast of water is soothing on my back. I have taken my portable UHF radio in case Peter T radios to see if we are here. I hear nothing. However, when I walk back I find that Peter T is there (5:20 pm). Kelly had left the spa 10 minutes before me and when changing back into her clothes at the car she had heard Peter call on the radio. I roll out the pizza bases while Peter F cuts up the salami, ham, onion, capsicum and some other things for the fillings. The wind has now dropped and it is a lot more comfortable. I make three garlic and cheese pizzas and five pizzas, two chicken ones. 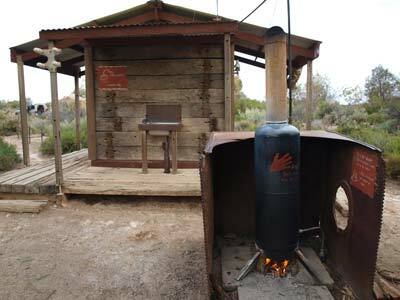 See a previous article about how to make pizzas in the bush. I cook them in the camp oven. They take about five minutes or so to cook each one. The best turns out to be chicken, feta, pineapple and sweet chilli sauce. There is an almost full moon tonight and it is spectacular as it rises to the east. The two Peters get some nice photos with their long lenses while I take some shots of the camp site. South Sydney is playing an important match tonight against Parramatta in the NRL (Rugby League). I pick up ABC702 from Sydney and listen to the match. Souths win 24 to 16. Brilliant! However, this is not enough to get them into the finals as they have lost too many matches by a few points earlier in the year. We head to bed at 9:30 pm.